Our Cross Trophy trial is an ideal introduction to off road events. 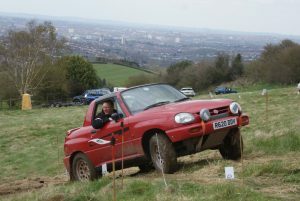 The event is one of the longest running on the club calendar and in recent years has been held at an excellent venue south of Bristol near Dundry with stunning views across the city. Unlike more serious off road events a car trial can be entered in an ordinary road car and is designed to be non-damaging although your pride and joy might get a little muddy. You car has to be 2 wheel drive so you won’t be competing against land rovers ! The aim of the event is to drive up hills subdivided with numbered markers from 12 to 1 – the further you get up the hill the lower your score. The person with the lowest score at the end of the day is the winner. More a test of skill than speed, trials are an ideal low cost introduction to off road motorsport. Entry fees are around £10 and no special equipment is required.